A scanned chunk of the new 2010 Mercedes-Benz E-Class with some complete technical information and images has been leaked in the marketing brochure. 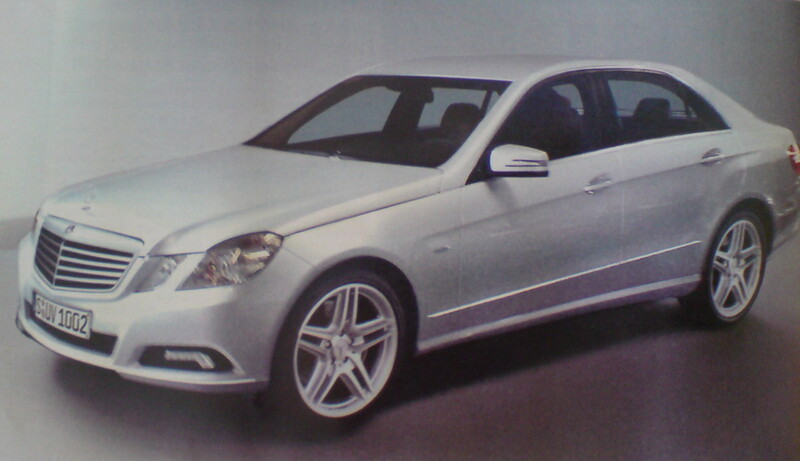 According to brochure the new E-Class is 4.868 metres long and has a wheelbase of 2.87 metres. It comes with an extent of engines with 4 and 6 cylinder models in both petrol and turbo diesel form. With the exclusion of the E350 4Matic models and E350 BlueTEC, all other models are BlueEfficiency equipped. Powerplants involve the E200 CGI with 135kW (184hp) and 270Nm, E250 CGI with 150kW (204hp)and 310Nm, E350 CGI making 215kW (292hp)and 365Nm, and the 285kW (388hp) E500 producing 530Nm. These is the first official images of the new 2010 Mercedes-Benz E-Class, which will make it debut at the 2009 Geneva International Motor Show. The new E-Class has grown in size, length and width for more comfort and interior space. Safety has been a paramount consideration of course and we see that in the new impact absorbing bonnet that pops up 5cm to lessen injury to cyclists or pedestrians in a low speed collision. There’s also a system that recognises potential collisions and warns through the driver’s pedal that it’s time to brake . Spy photographers caught the next-gen Mercedes E-Class at testing in less camo. A few strips of tape need to identify the main details of the new E-class to hide. These include the headlights apparently also the LED daytime running lights to the rear lights are integrated. The tape below the side windows coated by the designers as “character line” designated body-bend, stretching from the front Radhäusern up to the equally unmarked tail lights still attracts. This accident happened in Ventura county on the morning of September 5th. 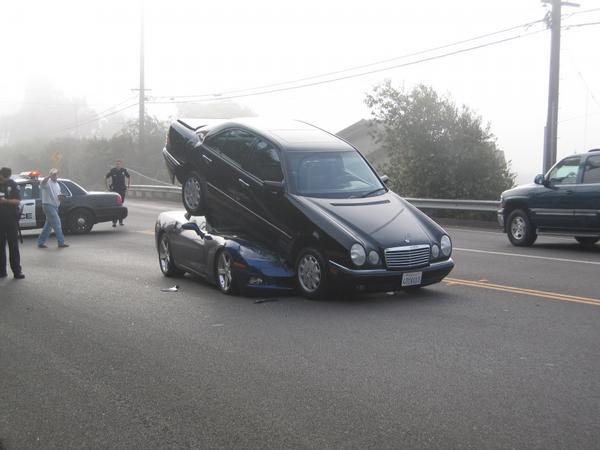 Corvette C6 ragtop rear-ended a Mercedes E-Class. Fortunately no one was injured, but you have to be impressed by the structural integrity of a convertible Corvette, considering that it drove under the Mercedes. German car magazine Autobild introduced the first photos of new 2009 Mercedes E-Class, which will be presented to the public at the Geneva Motor Show (5 to 15 March 2009). Until then, these first photos enough to recognize that much fresh, different from the family. Like the front, the typical C-Class, with glossy, kantigem grille. Unlike the middle class keeps the most important image makers, however, the striking face-to-face. Only that it no longer round lights shining, but aggressively angular lights. Due to the growing pedestrian protection E-Class to 4.91 metres in length, changing the wheelbase by two centimetres to 2.87 meters. The chassis will remain at the four-bar front axle, rear axle area handlebars and was only re-vote. Either swing the new E-Class on steel springs or air pillows improved “Airmatic”. Read more (+photo an details)! !